We also perform regular maintenance plans for your vessel. This can be tailored to suit your requirements and could be anything for a wash down once a month to a full detailing arrangement including starting your engines and checking vessel operations to ensure you are ready to go when you need it. We perform full maintenance packages for many high profile clients and often work with their vessel schedule to ensure the boat is in tip top working order prior to any use as well as maintaining a constant upkeep. 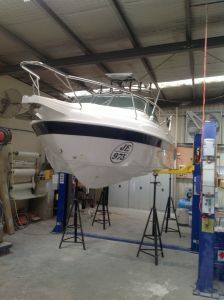 We utilize the best Australian Made Marine Grade products available. We are specialists in Mechanical Servicing and Maintenance. Let our mechanics take the stress out of boat ownership with a regular maintenance plan to ensure you remain boating trouble free and keep down your ownership costs. Contact us today for more information on what we can offer. Contact Us below to discuss your Vessel Maintenance requirements or give us a call to have a chat about what you are looking for. Let our team take the stress of boat maintenance and ownership so you can relax and take pleasure in the use of your boat.